Introduction: Perinatal asphyxia is a major cause for neonatal mortality and morbidity around the world. The reduction of O2results in the generation of reactive oxygen species which interact with nucleic acid and make alteration in the structure and functioning of the genome. We studied the effect of therapeutic hypothermia on chromosomes with karyotyping. Subjects and Methods: Babies in the hypothermia group were cooled for the first 72 h, using gel packs. Rectal temperature of 33–34°C was maintained. Blood sample was collected after completion of therapeutic hypothermia for Chromosomal analysis. It was done with IKAROS Karyotyping system, Metasystems, based on recommendations of International system of human cytogenetic nomenclature. Results: The median chromosomal aberration was lower in hypothermia [2(0-5)] than control group [4(1-7)] and chromatid breakage was commonest aberration seen. Chromosomal aberration was significantly higher in severe encephalopathy group than moderate encephalopathy group. Conclusion: We conclude that the TH significantly reduces DNA damage in perinatal asphyxia. Perinatal asphyxia is a leading cause of perinatal mortality in developing countries. According to the World Health Organization, in 2004, worldwide there were 133 million live births and 3.7 million neonatal deaths, 98% of which occurred in developing countries. About 23% of neonatal deaths were due to perinatal asphyxia. It is estimated that about 3% of live births in developing countries require neonatal resuscitation, but even in major hospitals in some developing countries resuscitation measures may be inappropriate. Perinatal asphyxia is a major cause for neonatal mortality and morbidity around the world especially in developing countries like India. Oxygen deprivation and excess accumulation of CO2 results in metabolic acidosis. This can alter the ionic exchange and cause defect in the liberation of adenosine triphosphate eventually leading to energy failure. Thus, cations accumulate inside the cell causing cytotoxic edema. The reduction of O2 results in the generation of reactive oxygen species (ROS) which interact with nucleic acid and make an alteration in the structure and functioning of the genome. Peripheral blood lymphocyte culture technique has been found to be useful in analyzing the morphology and aberrations of human chromosome. We studied the effect of therapeutic hypothermia (TH) on chromosomes with karyotyping. This study was a randomized, controlled trial among term babies with perinatal asphyxia. It was single-blinded and carried out at Tertiary Care Centre in India between March 2011 and June 2014. This trial was approved by Institute Ethical Committee and was registered in the Clinical Trial Registry of India (No: CTRI/2011/10/002094). There were totally 42 babies were recruited in hypothermia and 43 in the control group. Babies whose gestational age was ≥37 weeks with umbilical cord blood or arterial blood (within the first postnatal hour) pH ≤7 or base deficit ≥16 meq with evidence of encephalopathy and with any two of the following criteria viz: (i) Apgar at 10 min <5; (ii) evidence of fetal distress; (iii) assisted ventilation for at least 10 min after birth; (iv) evidence of any organ dysfunction, were included in the study. Babies were excluded from the study if they were more than 6 h of age at the time of randomization, had major congenital abnormalities, did not establish spontaneous respiration by 20 min after birth or parents refused consent. After obtaining informed written consent from the parent of the newborn fulfilling the inclusion criteria were randomized into hypothermia or control group using a computer-generated sequence of random numbers. Allocation concealment was done using sealed envelopes. Neonatologist who was not involved in the study did random number generation, concealment, and assignment of intervention. Babies in the hypothermia group were cooled by placing cloth-covered gel packs on the side of the chest, abdomen, back, head, and axilla to achieve target rectal temperature of 33–34°C. This temperature was maintained by continuous rectal and skin temperature monitoring. Vital parameters were recorded and at the end of 72 h, the cooling gel packs were removed one by one, and the radiant warmer was turned on to raise the body temperature by 0.25°C/h to reach the target temperature of 36.5°C. Cooling was stopped before 72 h if there was any complication. Both groups were treated with the same standard regimen, except for the hypothermia. Blood (1 ml) was collected after completion of TH (at 72 h) for karyotyping. 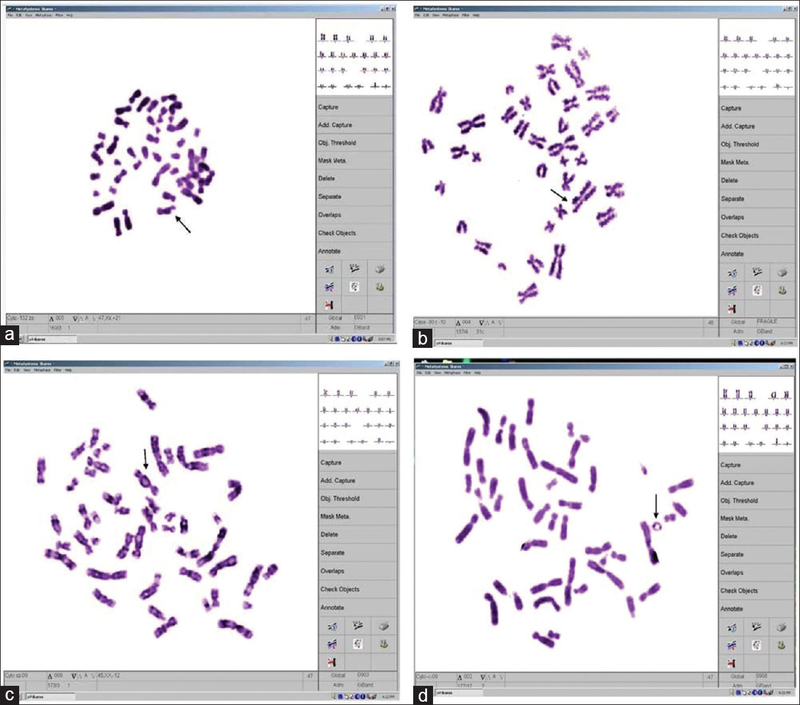 Chromosomal analysis was done with IKAROS karyotyping system, metasystems, Germany, based on recommendations of International System of Human Cytogenetic Nomenclature. Data were analyzed using both descriptive and inferential statistics. The continuous parameters were expressed as mean with standard deviation and the distribution of categorical data as frequencies and percentages. The comparison of the distribution of categorical data between the groups was carried out by using Chi-square or Fishers exact test. The mean between groups was compared using independent student's t-test. All statistical analysis was carried out at 5% level of significance, and P < 0.05 was considered as significant. The statistical analysis was carried out using IBM SPSS version 19.0. Karyotyping was done in 42 neonates of hypothermia group and 43 of the control group. Karyotyping was done at 72 h of life to assess chromosomal aberration. The detailed analysis on the comparison of chromosomal aberration between the groups at 72 h is given in [Table 1]. At 72 h (after completion of hypothermia), chromosomal aberration was significantly higher in control than hypothermia group (P < 0.01). The median chromosomal aberration was lower in hypothermia (2 [0–5]) than control group (4 [1–7]). Chromatid breakage is the most common aberration seen among both hypothermia and control group, followed by dicentric chromosomes [Table 2] and [Figure 1]. Comparison of chromosomal aberration in relation to severity of encephalopathy among hypothermia group is given in [Table 3]. Chromosomal aberration was significantly higher in severe encephalopathy group than moderate encephalopathy group. The median chromosomal aberration in moderate encephalopathy was 1 (0–3), and severe encephalopathy was 3 (1-6). In control group also, Chromosomal aberration was significantly higher in severe encephalopathy group than moderate encephalopathy group. The median chromosomal aberration in moderate encephalopathy was 2 (1–5), and severe encephalopathy was 5 (4–7) [Table 3]. To the best of our knowledge, this is probably first human randomized controlled trial to explore the effect of TH on chromosomal aberration [Figure 1]. We used gel packs to induce TH. Efficacy of gel packs in maintaining temperature has been proved in earlier studies.,, Inclusion criteria used for our study were relatively similar to that used in the National Institute of Child Health and Human Development trial for cooling study. In this study, we evaluated the effect TH on chromosomal aberration with karyotyping. In this study, maternal antenatal and intrapartum characters were similar in both groups. Chromosomal analysis showed higher number of aberrations in control group than hypothermia group. Our findings are in accordance with the findings of previous animal study, in which the effect of TH was studied in a rat model with occlusion of the middle cerebral artery and reperfusion. The study showed that TH attenuates the strand breaks. With the above results, we conclude that TH reduces the DNA damage in the cases with perinatal asphyxia. On subgroup analysis based on the severity of hypoxic-ischemic encephalopathy (HIE), chromosomal aberrations were found to be significantly higher in severe HIE than moderate HIE group among both hypothermia and control group. Previous studies have shown that outcome after hypothermic treatment was strongly influenced by the severity of HIE. TH is less effective in severe HIE than the moderate HIE cases.,,, It could be because of shorter latent phase, more secondary energy failure, and increased cortical gray matter neuronal death. Thus, we can postulate that TH is effective in all HIE cases but more effective in moderate than severe HIE. We conclude that the TH significantly reduces DNA damage in perinatal asphyxia. It could be an important mechanism by which TH works in HIE. ICMR and Institute Research Fund. Ahman E, Zupan J. Neonatal and Perinatal Mortality: Country, Regional and Global Estimates 2004. Geneva: World Health Organization; 2007. World Health Organization. The World Health Report 1995. Geneva: World Health Organization; 1997. p. 21. Rooney D, editor. Human Cytogenetics: Constitutional Analysis: A Practical Approach. 3rd ed. New York: Oxford University Press; 2001. p. 31-37. Bharadwaj SK, Bhat BV. Therapeutic hypothermia using gel packs for term neonates with hypoxic ischaemic encephalopathy in resource-limited settings: A randomized controlled trial. J Trop Pediatr 2012;58:382-8. Thomas N, George KC, Sridhar S, Kumar M, Kuruvilla KA, Jana AK. Whole body cooling in newborn infants with perinatal asphyxial encephalopathy in a low resource setting: A feasibility trial. Indian Pediatr 2011;48:445-51. Jacobs SE, Morley CJ, Inder TE, Stewart MJ, Smith KR, McNamara PJ, et al. Whole-body hypothermia for term and near-term newborns with hypoxic-ischemic encephalopathy: A randomized controlled trial. Arch Pediatr Adolesc Med 2011;165:692-700. Shankaran S, Laptook AR, Ehrenkranz RA, Tyson JE, McDonald SA, Donovan EF, et al. Whole-body hypothermia for neonates with hypoxic-ischemic encephalopathy. N Engl J Med 2005;353:1574-84. Chan PH. Reactive oxygen radicals in signaling and damage in the ischemic brain. J Cereb Blood Flow Metab 2001;21:2-14. Ji X, Luo Y, Ling F, Stetler RA, Lan J, Cao G, et al. Mild hypothermia diminishes oxidative DNA damage and pro-death signaling events after cerebral ischemia: A mechanism for neuroprotection. Front Biosci 2007;12:1737-47. Liu PK, Hsu CY, Dizdaroglu M, Floyd RA, Kow YW, Karakaya A, et al. Damage, repair, and mutagenesis in nuclear genes after mouse forebrain ischemia-reperfusion. J Neurosci 1996;16:6795-806. Chen J, Jin K, Chen M, Pei W, Kawaguchi K, Greenberg DA, et al. Early detection of DNA strand breaks in the brain after transient focal ischemia: Implications for the role of DNA damage in apoptosis and neuronal cell death. J Neurochem 1997;69:232-45. Manoj A, Rao R, Bhat V, Venkatesh C, Bobby Z. Chromosomal aberrations in perinatal asphyxia. Curr Pediatr Res 2012;16:8-14. Manoj A, Rao R, Bhat V, Venkatesh C, Bobby Z. Oxidative stress induced DNA damage in perinatal asphyxia. Curr Pediatr Res 2011;15:19-23. Manoj A, Rao R, Bhat V, Venkatesh C, Bobby Z. DNA damage in perinatal asphyxia using micronucleus assay. Curr Pediatr Res 2011;15:5-9. Gluckman PD, Wyatt JS, Azzopardi D, Ballard R, Edwards AD, Ferriero DM, et al. Selective head cooling with mild systemic hypothermia after neonatal encephalopathy: Multicentre randomised trial. Lancet 2005;365:663-70. Eicher DJ, Wagner CL, Katikaneni LP, Hulsey TC, Bass WT, Kaufman DA, et al. Moderate hypothermia in neonatal encephalopathy: Efficacy outcomes. Pediatr Neurol 2005;32:11-7. Iwata O, Iwata S, Thornton JS, De Vita E, Bainbridge A, Herbert L, et al. “Therapeutic time window” duration decreases with increasing severity of cerebral hypoxia-ischaemia under normothermia and delayed hypothermia in newborn piglets. Brain Res 2007;1154:173-80.